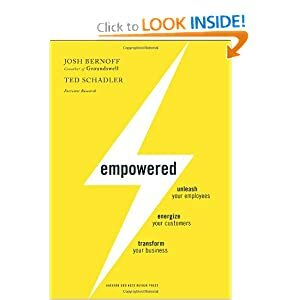 Thanks to Forrester and @bethggwaz for sending SMCLA a few copies of the newly released book: Empowered: Unleash Your Employees, Energize Your Customers, and Transform Your Business . We’ve actually had this book for a month now and our copy is already dog-eared with post-its and margin notes. It couldn’t come at a better time, really…with our October event that explores “Social Media Horror Stories” and ponders what to do in the event that your brand gets caught up in a “situation”. The book is targeted at large corporations who aren’t quite sure how they should get in on this whole “social media” thing. It lays out a thorough definition of what a “HERO” (Highly Empowered Resourceful Operative) is and what she does (influence peers, deliver groundswell customer service, empower customers and amplify fans) before finally telling you how to leverage a HERO to power the business. It’s in the final third of the book that the real nuggets of wisdom are shared: how to manage & lead, helping HEROs innovate & collaborate, and keeping them (and you) safe. The book is brought to you by Josh Bernoff and Ted Schadler. You may recognize Josh from his previous work: “Groundswell: Winning in a World Transformed by Social Technologies” . Similar to “Groundswell”, this book is topical and informative and goes to great detail to explain how social media and big business can work. My personal favorite showcases Dooce – Heather Armstrong (http://dooce.com) and her accurate and unfavorable portrayal of Maytag (as an example of the power of an influencer and why you need to foster HEROs/influencers in your own organization). Later in the book, Bernoff and Schadler go on to explain one of my favorite concepts: “customer service = marketing” and that the two organizations should be closely aligned if not merged. Now…take a step back and read that again. They’re suggesting that two completely different sides of the house get in bed together (and it makes sense). I won’t go into detail here, but I will say that if you read the book , it makes sense. People are talking about your service/brand and they aren’t gonna be happy until you reach out to them. It’s marketing/PR/customer service all in one. If you aren’t aligned to handle this (and within 24 hours btw) you’re in for a Dooce sized headache. One of the other MAJOR benefits of getting your hands on this book are the numerous graphs, stats, and points supported directly by the vast amounts of data being crunched over by our friends at Forrester. Typically, access to this data would cost you (or your organization) an arm and a leg. With the purchase of this affordable book, the data is all yours! The four-step IDEA process to transform your customer-facing service, marketing, and mobile applications. Ways your IT department can become the trusted partner for your company’s employee- and business-led technology innovation. The key techniques for collaboration systems that take off, instead of fizzling on the launch pad. 25 case studies and dozens more examples from companies in every imaginable industry, from retail to business services. If you’re an IT, marketing and strategy, or tech industry leader wondering how to get more creative solutions out of your team, this book is for you. We’ll be giving away 2 copies of this book at our upcoming event on 10-26 at Wokcano in Santa Monica. Please join SMCLA at this event and put in your business card to get a chance to get a must-have social media business book .